In the VDPA, under section C on “Cooperation, development and strengthening of human rights”, paragraph 67 gives special emphasis towards strengthening of a pluralistic civil society. However, we note the shrinking civil society space at Human Rights Council and the United Nations as a whole. For instance, non-governmental organizations at the Human Rights Council used to have an unlimited number of invitations for interested persons outside the UN to attend a side-event, however, this number was limited to fifteen persons in the previous sessions, and worse still has been further limited to only five persons as from this session. Furthermore, the process of accreditation is not convenient enough for people with limited internet access or computer skills, which is time consuming, and will be further discouraged from attending the Council for only a couple of hours. 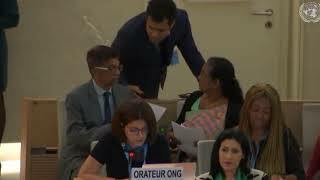 These actions will ultimately limit civil society’s desire to physically participate, contribute their expertise and best practices and inform their lived experiences to this Council about the grave and serious human rights situations that are discussed by this Human Rights Council and does not encourage anyone from outside the UN to attend the sessions and informal meetings and moreover, does not strengthen civil society space at the Human Rights Council. EAFORD and Geneva International Centre for Justice call upon this Council to put more emphasize on VDPA aspects so that civil societies and non-governmental organization work in reporting and preventing human rights violations are better implemented.